People have been using essential oils to treat common conditions that come up such as headaches, anxiety, bug bites, depression and sagging energy. The natural remedies provided by therapeutic essential oils tend to be more gentle and easier on biological systems than traditional medications that are often taken for the same issues. It is easy for people to make their own formulations with a few simple ingredients that can be found in the local grocery store along with the essential oils. 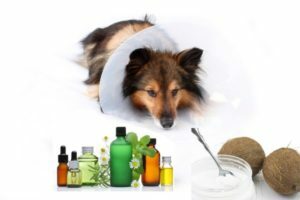 What most people didn’t know until just recently and are finding out more and more is that the same remedies that they can apply to themselves are also good treatments for their pets. Because essential oils are not toxic, they can be much better tolerated by animals than some of the common pesticides and chemicals that are used in flea and tick treatments. Because some essential oils can be irritating to the skin if they come into direct contact, it’s important to be as careful of that situation with your dog or cat as you would be with yourself. The advantage that animals have over humans is that they have a coat of fur that is usually enough of a barrier between the essential oils and their skin so problems of irritation are less common. As with any formulations that you would make for yourself, you should look for the highest quality essential oils to use for your pets. Pure grade oils are the best as they don’t contain any additives and are not adulterated in any way. Some low quality oils can contain solvents or alcohols that can be harmful to your pet if they are ingested so look for pure oils. They are more expensive but they are also more concentrated and will contain nothing but the essential oils that you want to use as a treatment. This oil can be used as a massage oil on sore muscles and joints that can be absorbed through the skin for the health properties contained in the oil as well as the aromatherapy benefits from inhalation. It’s important to rub the oil in very well so that the dog does not lick excessively and ingest a large amount of oil orally. This formulation is only one example of a blend that is as beneficial for pets as it is for the humans who love them. Most blends that people use for themselves are safe for use on their dogs as well but it is a good idea to check with your vet to make sure that there are no ingredients that could be harmful to them if they licked it off their coat. When in doubt, a few drops can be put onto a bandana that can be tied around the dogs neck for the aromatherapy benefits.